FACT: No MOU was signed on 14th September, 2017 as it was already signed in 2015. Lalu Prasad Yadav, Gaurav Pandhi, Shakeel Ahmed were among those who pointed out that the news of MoU signed was spread to gain the votes from Gujarat as the election is in December. Modi Govt didn’t sign any MoU for Bullet Train with Japan, reveals an RTI. So was an MOU for this over Rs 1 lakh crore project actually signed or was it a political stunt as claimed by several people on Twitter? Yes, it is true that India and Japan did not sign an MoU on 14th September, 2017 as it was already signed in 2015. 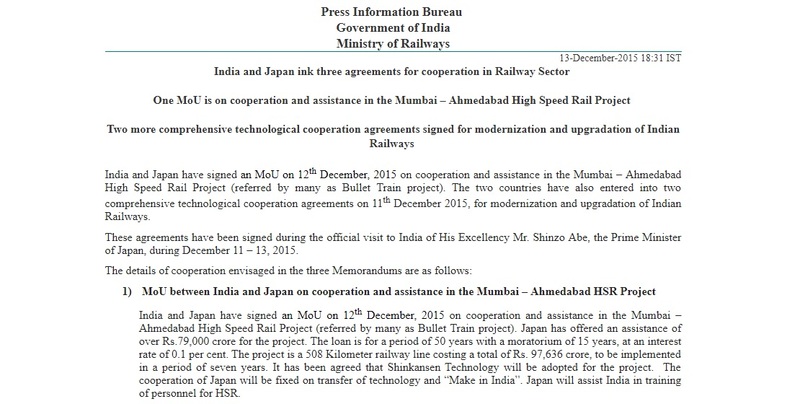 A PIB release dated 13th December, 2015 clearly states that an MoU was signed on the 12th of December 2015 between India and Japan on cooperation and assistance in the Mumbai – Ahmedabad HSR Project. It also states that Japan has offered an assistance of over Rs. 79,000 crore for the project and that the loan is for a period of 50 years with a moratorium of 15 years, at an interest rate of 0.1 per cent. 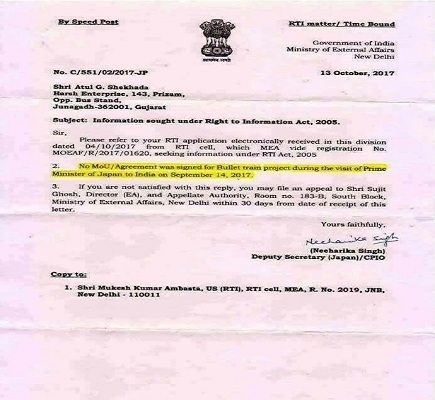 An RTI reply only answers the question that has been asked and gives no other information. That explains why the reply only states that no MOU was signed on 14th September, 2017 but does not reveal that the MOU was already signed in 2015. 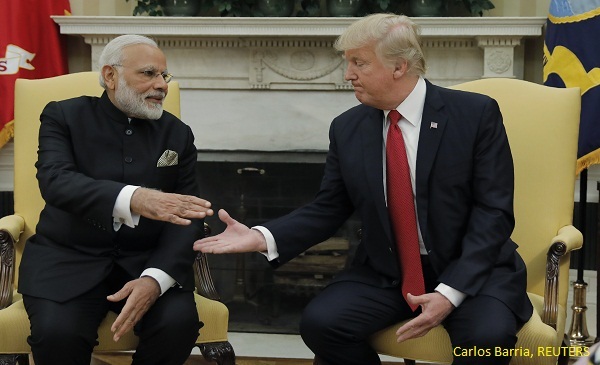 But this does not imply that an MoU between India and Japan was never signed for the high profile Mumbai – Ahmedabad Bullet Train Project.